Readi Bed Pads are high performance, washable and reusable absorbent underpads that are designed to protect both the patient and the bed, keeping both dry and the patient comfortable. Readi Bed Pads look and feel just like normal bedding, resulting in little or no embarrassment for patients. Readi Bed Pads deliver outstanding levels of performance thanks to the unique Readi stay dry technology construction. The pads consist of 5 layers that combine comfort and protection with advanced moisture absorbing properties. The pad gently draws fluid away from the surface to enhance patient comfort and leads to peace of mind through the night for those with incontinence. The unique design provides market leading levels of absorbency, capable of holding up to 2500ml for optimum performance and patient confidence. Readi Bed Pads also have a soft, cushioning feel with no uncomfortable, protuding stitching or quilting patterns. 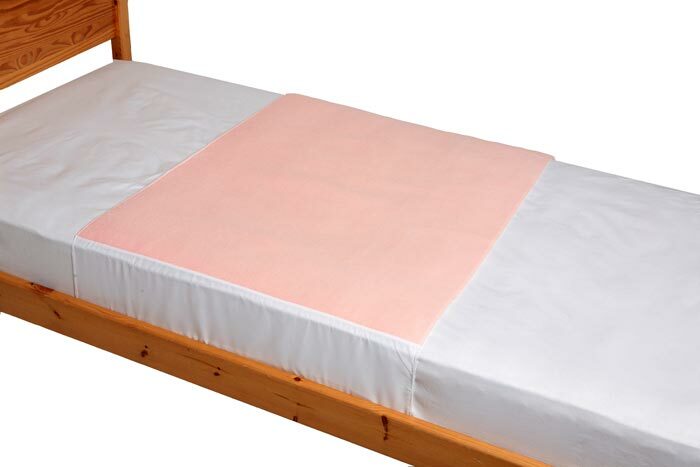 Readi Bed Pads can be washed and dried in the same way as ordinary bed linen. They are guaranteed for at least 300 wash and tumble dry cycles in domestic washing machines, thus offering a cost effective long life. They are also environmentally friendly when compared to disposable continence products, which absorb considerable amounts of raw materials and energy during production. The standard Readi Bed Pad provides light to moderate continence care and is supplied with tuck-under wings; particularly suitable for patients confined to bed by providing extra security against the pad moving.